Thousands Kneel, Shout “Shame!” at Trump Hotel in DC. 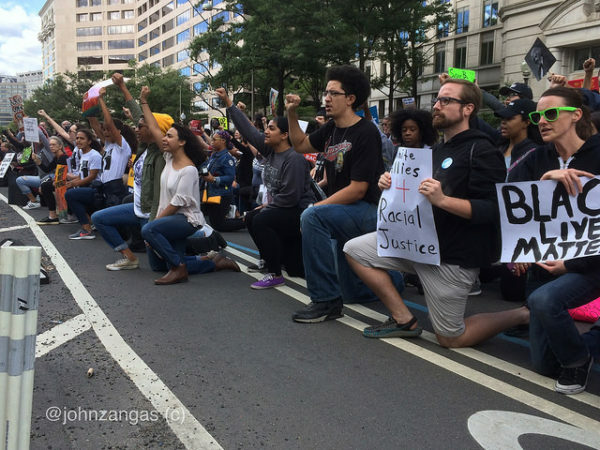 Washington, DC – Tens of thousands marched for racial justice on Saturday, calling for racial equality, an end to police violence and white supremacy. Black women carried the lead banners for the March for Racial Justice, accompanied by Native Americans drumming. Many marchers displayed messages of disapproval of President Trump regarding his divisive comments about the NFL protests against police violence and his inadequate Puerto Rico relief efforts. The marchers were joined by a group of a thousand Black women who had just marched from the Capitol to join them at Lincoln Square Park. The combined groups marched from Lincoln Square Park, past the U.S. Capitol and the Supreme Court, chanting “Black Lives Matter” and “Black Women’s Lives Matter,” their chants reverberating from the marble edifices as police silently looked on. “We hold the Department of Justice to account, that’s why we’re here,” said one speaker who was with the March For Black Women. “We hold racist policies, racist policing and surveillance in our communities to account. That’s why we’re here,” she said. Thousands then knelt on Pennsylvania Ave. outside the Department of Justice. There was a moment of silence for those slain and for others suffering from the consequences of racial injustices. They proceeded towards the Trump International Hotel two blocks away. The Trump International Hotel in Washington, only blocks from the White House, has become a symbol for Trump himself and a lightning rod for venting pent up frustration and anger at him and his administration. Demonstrators continued on to the National Mall where speakers held a rally and discussed how racial inequality is harmful to the nation. Rev. Grayland Hagler said the current racial tensions were always here but have been given new life under the current administration. “It’s significant that you have a relatively young crowd that has shown up to be engaged in resisting the kind of politics and misguided ideologies that have come alive again,” he said. Hagler put the blame for the current racial discord squarely with Trump’s statements equating counter protesters with White Nationalists in Charlottesville and criticizing professional sports team players who have come out in support of Colin Kapaernick’s kneeling protest last year of police killings of unarmed blacks. “White Supremacy has been given aid and comfort by a so-called president and so-called administration, and so-called leaders of that ideology are comforted and feel that they are back as a centerpiece of American political life,” he said.